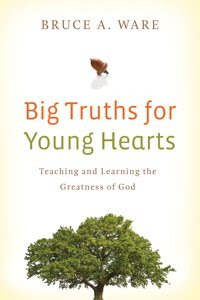 BIG TRUTHS FOR YOUNG HEARTS, Teaching and Learning the Greatness of God, by Bruce A. Ware, Crossway Books. I love connecting the dots in Scripture and so I love the study of systematic theology, biblical theology, and doctrine. I love these because they organize God’s Word into topics and themes that show how to connect Genesis to Revelation. This has been especially helpful to me in understanding the application of God’s Word in the day to day events of life. Out of my love for this, for about the last 2 years I have shared this passion with a small group of brothers and sisters from the church studying a course called Evangelical Systematic Theology taught by Dr. Bruce Ware of Southern Baptist Theological Seminary in Louisville, Kentucky. We have listened to about 60 lectures from his class at the seminary and then had discussions together on the material. We all have been richly blessed and nourished by his outstanding teaching as he guided us through God’s Word. I am especially delighted and commend to you an outline of his course of systematic theology that he has put into short devotionals. These are designed to help you speak to your children about the great doctrines of the faith and it will help you as well in understanding them. Designed especially for speaking to elementary age children and up (teens will be served by using it as a personal devotional), this is an incredible resource to put under your Bible. It will bring out the riches of God’s Word in new and marvelous ways to your entire family. Father’s Day is approaching and it would be a great gift to a father who wants his family to understand the supreme treasure of God in Himself, in Christ, in the Holy Spirit, in His Word, and in the gospel. We started reading this book for morning devos & already the boys are connecting the dots. After the 1st chapter on God revealing Himself in creation, Eli later made the comment at the zoo, "the birds fly around & see the wondrous works of God."